1) Is There Some Membership Options Associated With This Medical Alert Bracelet? Certain medical alert bracelet providers offer value added benefits to individuals who wish to garner a membership of those organizations. Certain membership options, such as GPS locators for elderly members suffering from Dementia, discounted rates for children, and wallet cards offer great benefits for just a little extra cost. 2) Does This Medical Alert Bracelet Come With A USB Port? Certain latest technology bracelets incorporate a built-in USB port, capable of storing all your health information and medical records. People with intricate histories of severe health issues can tremendously benefit from this information stored in their bracelets, especially in the event of an emergency. Ask your provider if the medical alert bracelet you are selecting comes with a USB port. If you consider the affordability of this extremely top-notch feature, you will see how viable it is to obtain. 3) Can This Bracelet Contain All My Medical Information? When making a selection, you need to keep in mind the information that you need engraved on your bracelet. Often your bracelet provider organization or company would help you select the option which accommodates all that you need printed. Instead of browsing through endless designs, this factor would narrow down your search. 4) Does This Medical Alert Bracelet Have A GPS Chip? If a medical alert bracelet is needed for a patient suffering from dementia, you may want to opt for a medical alert bracelet incorporating a GPS locator chip. With this chip embedded, you can retain your peace of mind regarding your ward. People with severe dementia are prone to wandering off and getting lost often. This chip ensures that they can always be found. 5) Is This Bracelet Comfortable? Since you are expected to wear your medical alert bracelet all the time, or even for protracted periods, make sure it is extremely comfortable to wear. It’s prudent to try on multiple bracelets before purchasing one. Even if you order online, choose a provider which offers satisfaction guarantee, in case you don’t like the feel of the bracelet after trying it on. 6) How Visible Is The Red Medical Alert Symbol? Although medical alert bracelets are all the rage these days, so are other types of jewelry. The last thing you want is for your medical bracelet to go overlooked and mistaken amongst the other trinkets that you are wearing. The medical alert bracelet would lose its purpose if the first responder mistakes it as an ordinary bracelet. To ensure that your bracelet is highly visible, always look for a design where the red alert insignia is clearly discernable. 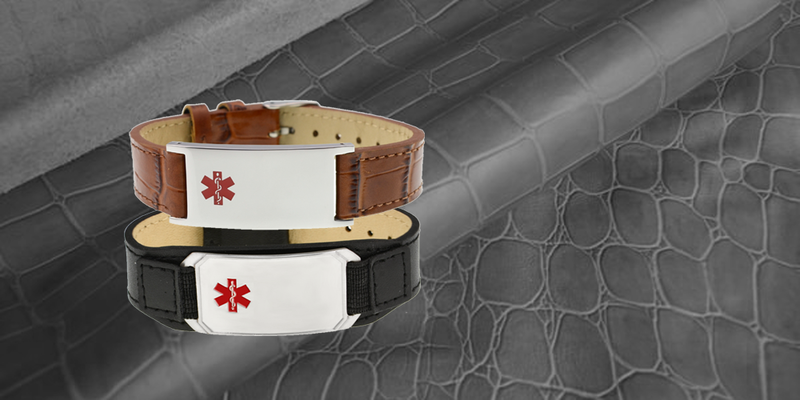 If you want your medical bracelet to catch the eye of the first responder, this feature is extremely indispensable. 7) What Is This Medical Alert Bracelet Made From? Along with the plethora of designs, medical alert bracelets are crafted from various different materials, such as Titanium, silver, gold, stainless steel, or Leather. For instance, if you are allergic to Nickel, stainless steel bracelets are not for you. Although, stainless steel bracelets are more popular than any other type, they contain trace amounts of nickel, which might induce allergic reactions in some people. If that’s the factor for you, be sure to inquire if the bracelet contains Nickel. This entry was posted in New Medical ID Bracelet and tagged Medical Alert Bracelet.